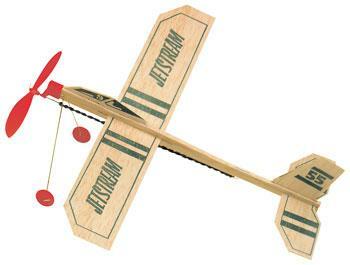 The Guillow's Jetstream is All Balsa Wood Airplane Glider with Landing Gear and Powered by A Rubber Band. Suitable for Ages 8 and Older. Retail $71.82 SAVE 30% ! Made of genuine balsa wood (die-cut sheets). Easy-to-fly and assemble (constructed with slots). Hand launch or ground level take-offs. Pre-printed green stripes, "Jetstream" and 55. Instructions for flight and assembly printed on package.